While perusing the recent Twitter lists that I have been added to, I spotted several that were generated by @formulists. Intrigued, I Googled it and was led to an interesting service that automatically creates Twitter lists based on particular specifications. With each list, you have the option to have it only follow up to a certain number of people as well as have the list be public or private. You can also apply the filters for location, keywords in bio, and the last time someone tweeted. You can also narrow it further down to a specific number of followers, following, and ratio of followers to following. This is useful if you want to see the people who have the most amount of reach. So what kind of lists can you create? There are currently 15 list types that you can choose from. These are the ones I find the most useful so far. 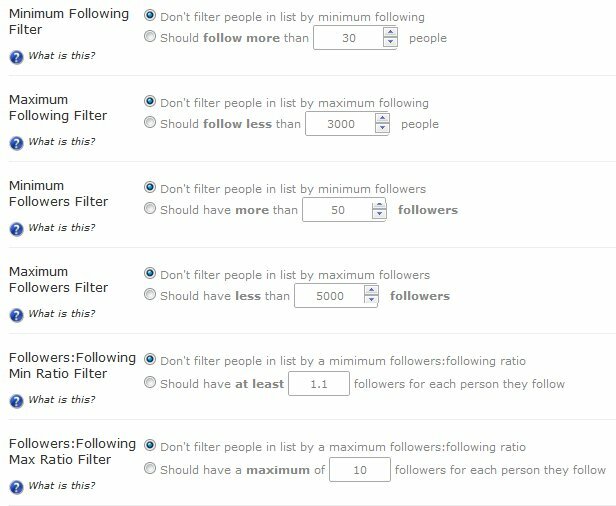 Filter My Following – this list allows you to simply filter those you follow with the above basic filtering options. This can be especially helpful to keep an eye out on a specific demographic of people you follow, especially if you automatically follow everyone back like I do. Mutual Friends – this list automatically updates with users that many of your friends follow. This is a great way to find out if there is a new influencer out on the scene that you might want to be in contact with as well. Who My Friends Talk To – this list automatically updates with users that your friends interact with. You can specify the number of your followers who must interact with a user, the number of times they must interact, and so on. 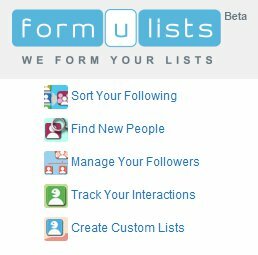 Recently Followed Me – this list automatically updates with users who have just started following you. You can choose to have the list automatically remove new followers after a specific amount of days to keep the list from getting too large. Recently Unfollowed Me – this list automatically updates with users who have just stopped following you. This list might be a good reminder to re-connect with someone that you have forgotten, assuming that is why they unfollowed you. Alternatively, you can use this list to remove people who have unfollowed you. Does Not Follow Me Back – this list will show you the current users who are not following you. Another good one to prune your list of people and improve your following to follower ratio. People Who Retweeted Me – this list automatically updates with users who retweet you often. You can specify the number of times someone has to retweet you to be included in this list, as well as exclude people you already follow or people you don’t. This is a great way to see who is most into what you have to say. To see how this works, check out this quick and easy setup video. They also have a blog with several how-to entries on filtering, auto-updating, clouds, and more. 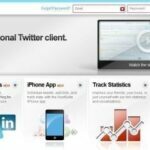 This website is currently in limited access, and only offering a certain number of spots per day for people to sign up (there were 54 as I wrote this article), so check it out and start creating Twitter lists that will help you get to know your followers even better. Have you tried out Formulists? Which lists have you found the most useful, and what have you learned from them about your followers and following?